Sorry I have been out of touch. It has been quite a week and the following was written last Sunday night/early Monday morning. It is 2:50 am and I am in the hospital emergency room with my husband. He fell getting out of a hot salt water and baking soda tub soak and cut his head badly enough to need stitches. 🙁 This happened around 11 pm. I’m wondering why isn’t any of the support staff who work in this hospital at this time of night happy? They chose this job and I know it’s the middle of the night but this is their shift, right? I mean like, shouldn’t they be prepared for it? – unlike me at this moment. Looks like we’ll be lucky to get out of here at 5:30 am. Emergency rooms are just no fun. No smiling faces and waiting, waiting, waiting. However, the doctors have all been very nice. Hospitals, architecturally and visually, seem to be so poorly designed and outfitted. To get a chair to be able to sit next to my husband’s bed was quite an ordeal. Why don’t they have chairs available? Yet they make room for chairs that are all connected as one complete unit in a large waiting room area, that sits completely empty. Well who would want to be out there if your loved one is in an emergency situation? You want to be right by his side. And who picks these wall colors or floor patterns? Or the lighting? Really. I see a huge opportunity for architects and interior designers to make these places function much more efficiently, look and feel a whole lot more cheerful and therefore the people who work here and visit would have a much healthier, happier attitude. This emergency room reminds me of all of the TSA security checkpoints in airports. They all still look like makeshift operations, no accounting for process in the design, expecting old folks to balance on one leg to take a shoe off or put one on. I mean really, we’ve had these checkpoints now for 16 years! And the gloves!! No longer latex because of too many allergies – they are now made of nitrile – whatever that is – but probably neither one is biodegradable so I fear the whole earth will be covered in this substance and nothing will be able to breathe!! Yikes! One doctor alone says he goes through more than 50 pairs a shift! Thank you for allowing this little rant of mine. Writing this on my phone has helped to calm me down in this situation, while my husband gets stitched up. The plastic surgeon is doing a beautiful job!! We never know our next steps, do we? That is why we should always eat well, be joyful and enjoy every moment in the moment! Ottolenghi grilled leg of lamb recipe with red peppers and cilantro garnish. The recipe says this looks fantastic when served on a large platter over a bed of fresh parsley – leaves and stalks. You can sear the meat, grill the peppers and make the sauce (without the herbs) – all in advance, then finish the meat and add the herbs to the sauce at the very last minute. I did not do this but sounds like a good idea! Because a deboned leg of lamb is always different thicknesses, this way of sectioning the lamb into more uniform pieces is a really brilliant way to cook it! Start with the marinade. In a large bowl combine the garlic, lemon zest and juice, the chopped rosemary leaves, olive oil, 1½ teaspoons of salt and 1 teaspoon of pepper and stir well. Cut the lamb into 4 or 5 even pieces in thickness and add to the marinade. Use your hands to massage the marinade into the meat. Put in the fridge and leave to marinate for a minimum of 2 hours or overnight. Preheat the oven to 425ºF. Take the lamb out of the fridge at least an hour before cooking. Place a large ridged griddle pan on high heat. Drizzle the peppers with 2 tablespoons of olive oil and ¼ teaspoon of salt and place on the grill. Cook for about 7 minutes, turning once, until charred on all sides. Set aside to cool. Put the lamb pieces on the hot grill and cook for 2 – 3 minutes on each side or until charred all over and starting to caramelize. 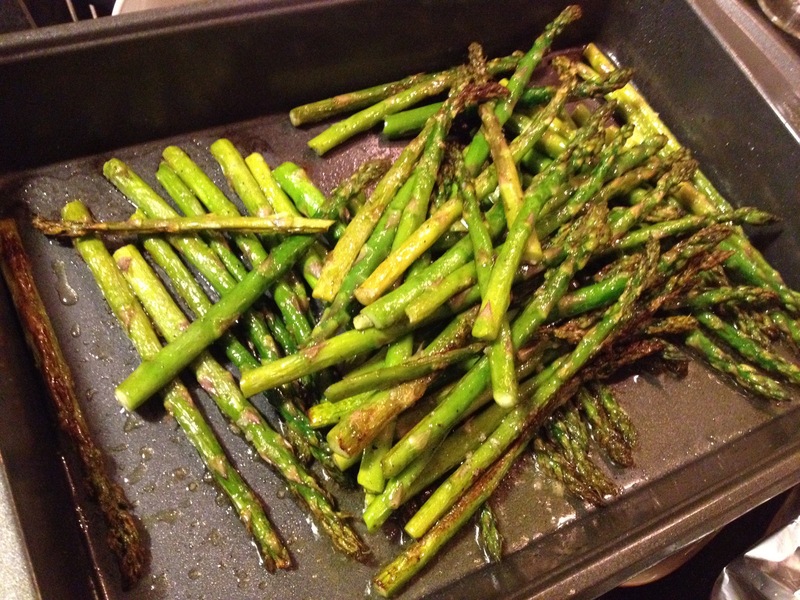 Transfer onto a roasting tray and put in the hot oven for 4 minutes. The meat should reach a rare to medium stage by then (leave a few minutes longer if you like it well cooked). Check by pressing against the meat. The less the “give” the more it is cooked. If you aren’t sure, just make a small incision to check for the color or use a thermometer and it should be at 120 degrees for rare to medium rare. 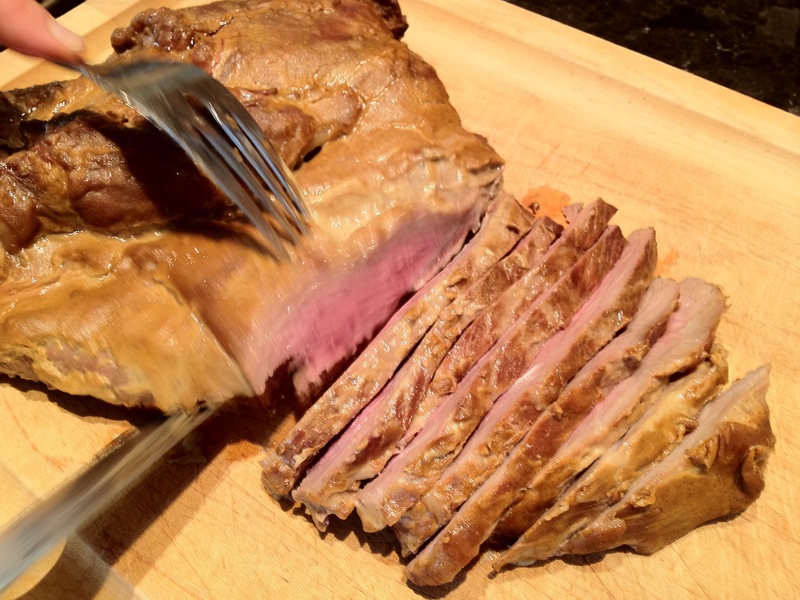 Once the lamb is cooked, remove it from the oven and leave it to rest for 5 – 10 minutes on a cutting board or platter. Meanwhile make the sauce. Heat 3 tablespoons of the olive oil in a small pan and add the almonds. Cook for 3 – 4 minutes stirring continuously until the nuts are golden brown and evenly cooked. Remove from the heat and allow to cool a little in a shallow bowl to stop the cooking. Place the nuts in a food processor and roughly crush. Mix in the lemon zest and juice, honey, orange blossom water, ½ teaspoon of salt, ½ teaspoon of pepper and the remaining olive oil. Mix well and set aside. When you are ready to serve, carve the lamb into 1/3″ thick slices and arrange it on a platter along with the peppers. Add the freshly chopped herbs to the sauce and spoon on top. Garnish with cilantro leaves. Serve any of the remaining sauce on the side. Serve with LOVE. Total DELISH!! So many people wrote to me that they were making my pecan pie recipe or my cranberry sauce or dressing for Thanksgiving! It’s so nice they let me know and it gives me such great joy to know that people are making my food all over the country and loving it! Actually, all over the world as our son, Zach and his fiancée, Agata, were in touch with me often from Warsaw, (thank goodness for Facetime! ), as they made my whole Thanksgiving dinner from my book and entertained 11 people for dinner with only one guest being an American. Zach, Agata and I chatted at length last Saturday, on my birthday, and they told me how much joy it gave them to see all their friends truly relishing every bite. Everyone just loved every part of their dinner, with even one of their guests getting up and sneaking the crumbs left in the pecan pie plate! How very happy it made them to see all of that! That, to me, is the joy of entertaining and feeding people. That is what gives me so much pleasure. Here are pictures of their table in Poland and their turkey. Zach and Agata also said they didn’t know how I cooked Thanksgiving dinner every year, that it was SO much work. They remarked that the two of them were working together and that I did it pretty much by myself. Isn’t that so sweet? I do get help from my husband and honestly, I haven’t made it the last two years. I wanted to share with you my big birthday celebration. 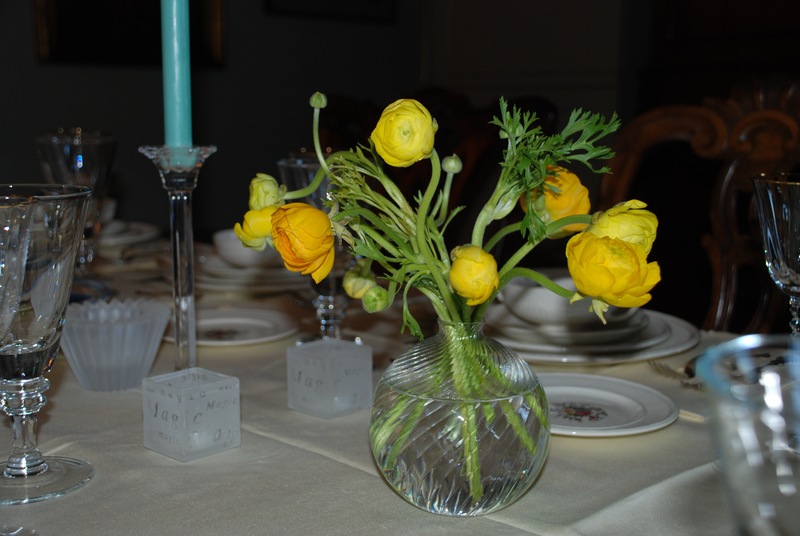 Our oldest son, his wife, and my husband made a beautiful dinner and our friends, Anne and Frank, joined us. But before dinner, they sat me down on the sofa in front of the fire and played a video that they had made of my friends and family from all over the world, singing or wishing me a happy birthday!!! It was incredible and literally brought me to tears. Such an amazing, fun and super sweet gift! For the dinner, they made homemade pici pasta with a parsley, sage, Parmagiano pesto, a beautiful half-leg of lamb on the grill with Julia Child’s mustard, garlic, soy marinade, and a delicious chocolate cake. That recipe was from Home Cooking with Jean-Georges cookbook, which I will share with you later. Here I am, carving the lamb. I know I am so lucky!! As you get ready for the holidays, you may want to check out and download my holiday cookbook of small plates, savory and sweet. It’s free and yours for the taking. Our holiday winter MARY’s secret ingredients box starts shipping tomorrow – Monday! Makes a great gift that will arrive in time for the holidays. And every purchase contributes to our partnership with Feed The Children. Maybe this can be the year we eradicate hunger. Wouldn’t that be nice? 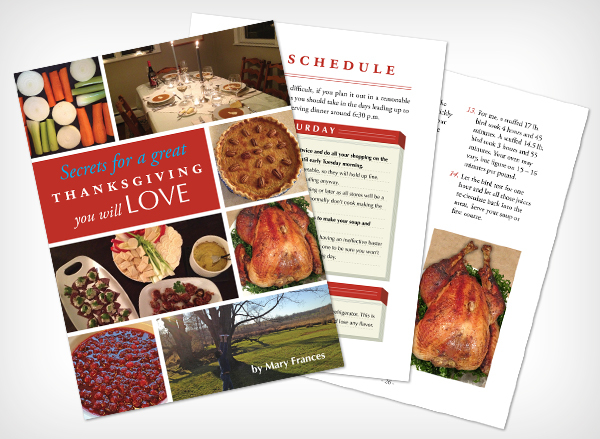 I wanted to let you know that our Thanksgiving e-cookbook is now available on Amazon. Download your copy and let it help make your life easier next week! The book is already receiving rave reviews for its fantastic scheduling help (planning is an essential part of stress-free cooking!) and of course the scrumptious recipes. It is also beautiful to look at thanks to our wonderful designers here. My family is very excited for Thanksgiving!! Everyone is coming from different places and at different times, but we will all be upstate by Wednesday evening. Everyone wants to contribute and help. Such excitement. There will be just six of us – both of our boys and we’re lucky to have both of their girlfriends too. One celebrated Thanksgiving four times already with different relatives and the other one’s family, (being natives of Poland), does not really celebrate this holiday. We are so lucky that we get to have them! This past weekend, we had our neighbors from down the road over for dinner. We just met them. Ronny and Cathy are the owners of Ronnybrook Farm, along with Ronny’s brother. If you live here on the East coast, you may know them for their super creamy, fantastic ice cream, chocolate milk that is to die for, yogurt, regular milk and now eggnog, at this time of year. They brought us some ice cream and eggnog. I love eggnog but never buy it as it’s really very fattening. But hey, now that it’s in my fridge and was a gift, I have to have a little, right? My father loved eggnog around the holidays. He liked it both straight or spiked with a bit of bourbon but he always sprinkled some nutmeg on top. Isn’t it funny how all of these food memories are so fresh to me. I must have been destined to write this blog and share food stories. 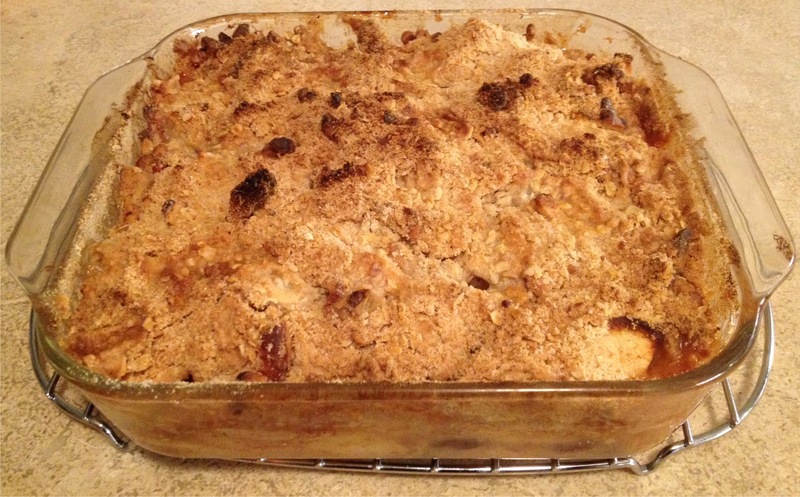 Apple crisps are easy to make, and warmed up with a little ice cream it’s a bit of heaven! With working so hard to launch the e-cookbook last week, I have Thanksgiving fully on the brain. I’m starting to really think about all the things I’m grateful for: Time together with my family. New and old friends. Being able to show these people how much I love them with food. Being cooked for by some of the very talented people in my life. You, my dear readers. And even eggnog! There is one more thing too. 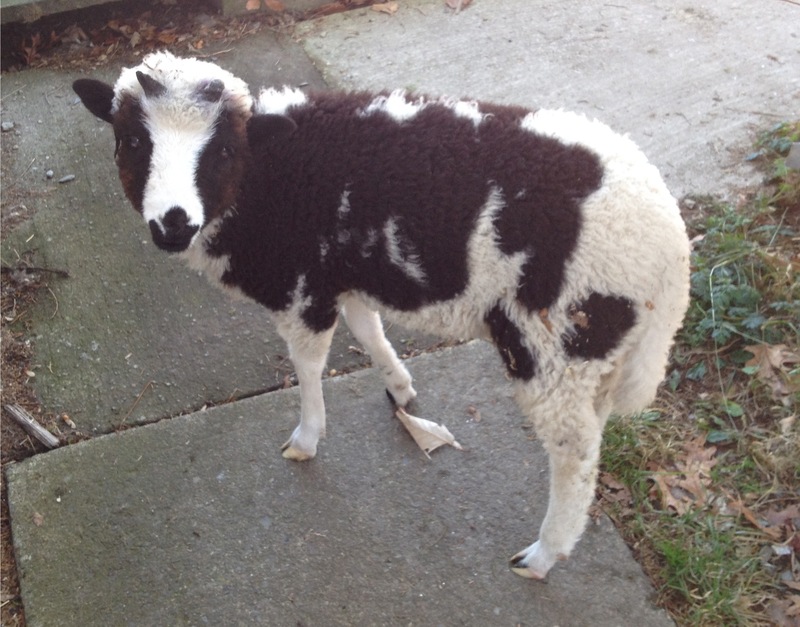 Remember adorable Domino? We saw him over the weekend and he is growing up so fast! Notice his horns are two different sizes. 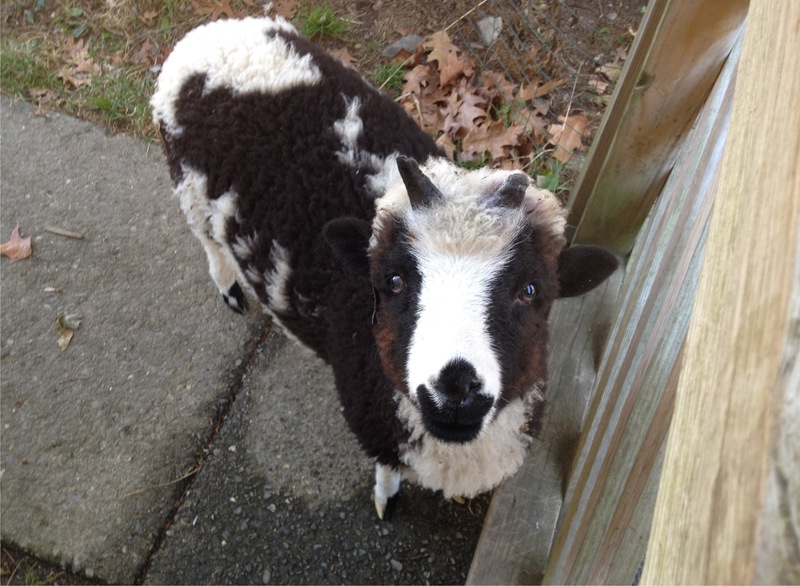 Ethel says he keeps bashing them, but they do grow back. He’s so cute. He hangs out with her two dogs and wants to be petted like them too. Only he won’t chase the tennis balls! 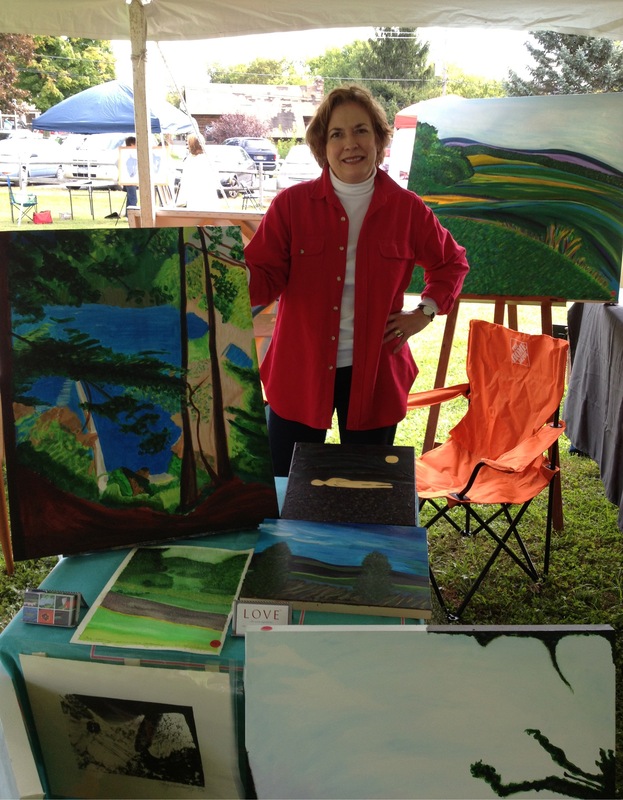 Today and tomorrow, I am exhibiting my paintings at the Hillsdale Art Fest in Hillsdale, NY. It is an event sponsored by the Columbia County Council on the Arts. It’s always so much fun to meet other artists and see what they’ve been creating, what they feel they need to express to the world. I have been trying to abstract landscapes. It’s hard. I don’t know why it’s so hard but it is. I feel I am making progress but I am not yet there, to my satisfaction. My medium is acrylic and for sketches I prefer pastels or watercolors. Our good friends Margaret and Wayne came to visit us at the Art Fest and brought us the news that their dear friend and young colleague, 47 years old, dropped dead of a heart attack on the street outside of his house in Brooklyn, after going for a morning run. He wanted to make sure he was back in time to take his 10-year old daughter to her first day of school. Shock, grief, disbelief. How could this happen? We knew this young man as well. We were all together in Vancouver at a conference this time last year. So Margaret said they are coping and one way to cope is to cook a meal and have friends over for dinner. We are those lucky friends and went to their house tonight for dinner. She said she needs to cook to occupy herself, and keep her mind on something else. As Molly O’Neill said at Longhouse, cooking a meal orders her. There is a beginning, a middle and an end. Cooking and conversations about food are great unifiers. 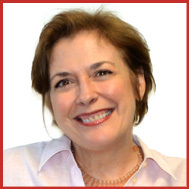 I recently had a lunch scheduled with a woman from a competitive brand design firm. I had the idea that perhaps we could partner on some large government projects. At the last minute, she was called into a meeting so she sent two of her colleagues, whom I had never met, to meet me for lunch. It was an odd set of circumstances but okay, let’s go with the flow. So we all talked about each others’ businesses and types of work and so on. They were both very reserved and naturally cautious about revealing too much about their business. After about 30 minutes of this chit chat, I casually mentioned that I have a food blog and pulled out my LOVE business cards. Well, I want you to know, their facial expressions, posture and attitude changed immediately. They wanted to tell me about their cooking, their kid’s cooking, what was in their pantry and favorite recipes. It was a change so drastic, it was palpable. It was so lovely! After I returned to the office, I received a call from the woman I was supposed to have lunch with and she was exuberant about how these two ladies came back and couldn’t stop talking about my food blog! I’m telling you, we should all break bread with our challengers and rivals. Everyone has to eat. Food is the great connector and equalizer. Margaret needed to cook for friends to bring some order back into her life. Here’s her beautiful meal from tonight. 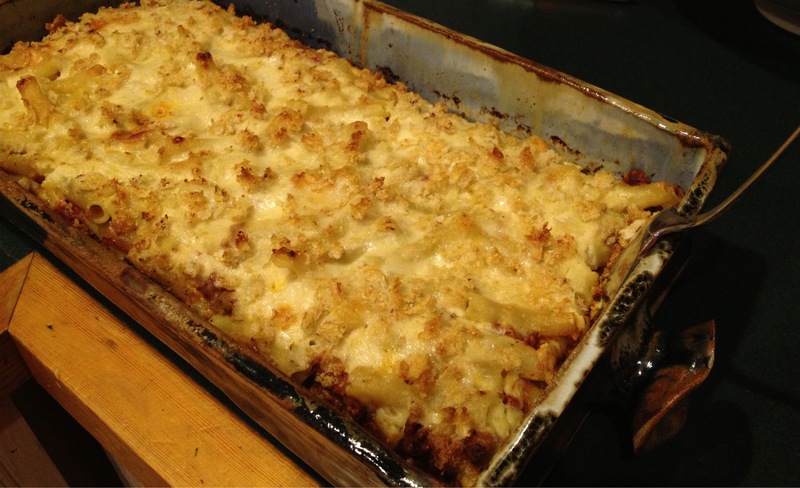 Greek casserole pastitsio combines béchamel, pasta, ground lamb, tomato sauce, cheese, cinnamon and nutmeg. Super homey, yummy and delicious! This is not Margaret’s recipe, but this gives you an idea of this dish. 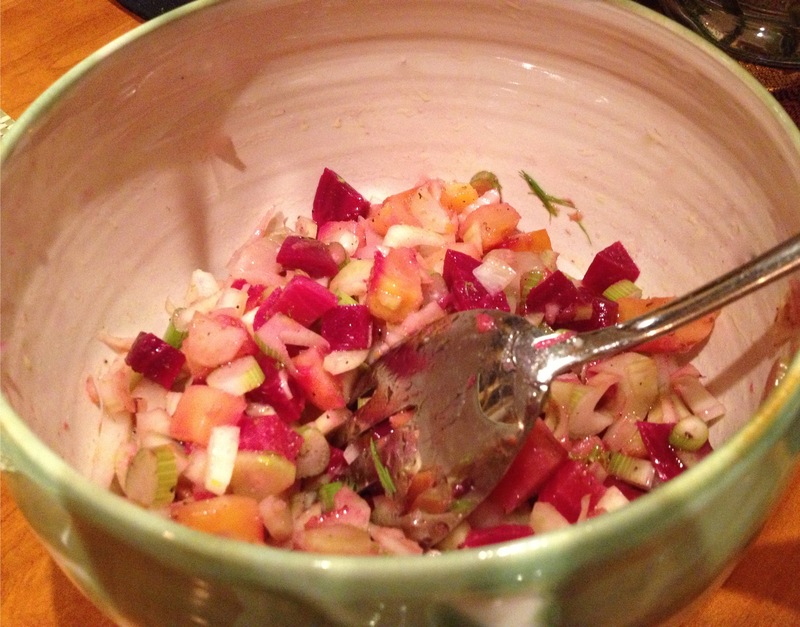 A delicious beet and fennel salad. I hope you’re eating great food cooked with LOVE and that this blog helps you do that. So you may remember, my husband was raised Jewish and I was raised Catholic. We are now Unitarians but culturally we celebrate both traditions, and why not? It’s way more fun this way! 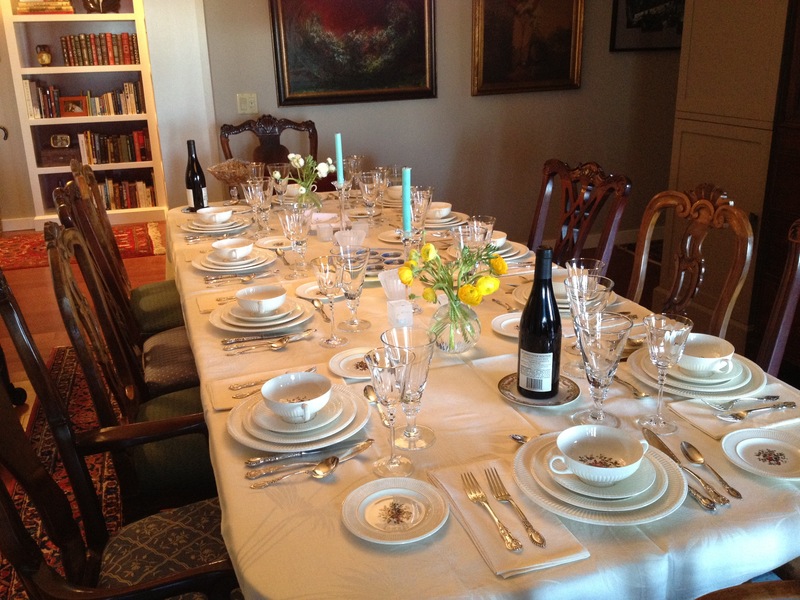 We hosted a Passover seder on Friday night for eleven people – old friends, new friends, family and girlfriends from 4 different countries and both coasts. It was such fun – lots of wonderful conversations and the traditional readings and food, with some new traditions thrown in. The party lasted until nearly 1 am – I do believe a good time was had by all and that makes it all worth it. 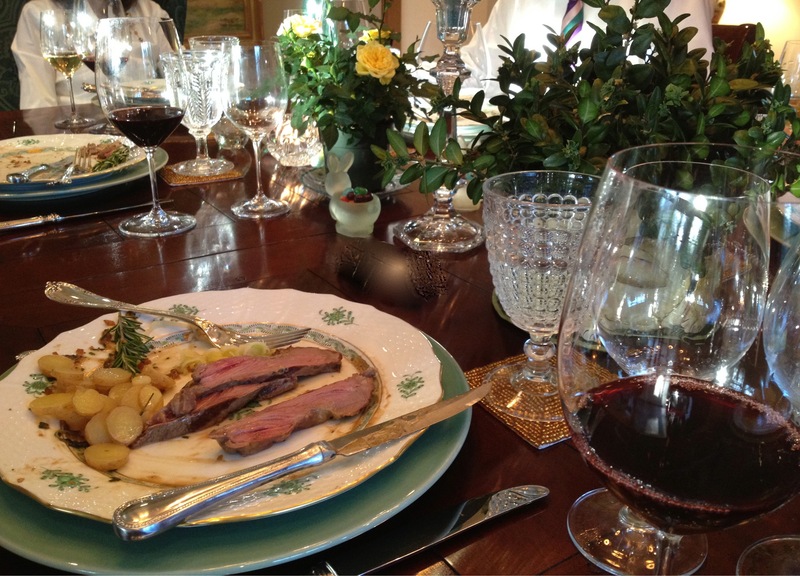 My brother hosted Easter dinner in CT – and early dinner with cocktails outside on that gorgeous day, serving a beautiful butterflied leg of lamb with Julia’s traditional and delicious mustard coating with a Madeira sauce, but starting off with 2 spectacular spinach soufflés! We are spoiled! I hope you enjoy the photo gallery and remember, the brisket recipe is here on the blog. Tell me what you did this past weekend! This dish is scrumptious!!! You have got to try it and see the look of love on the faces of your eaters!! Comforting and bursting with flavor, it’s a perfect Fall dish. 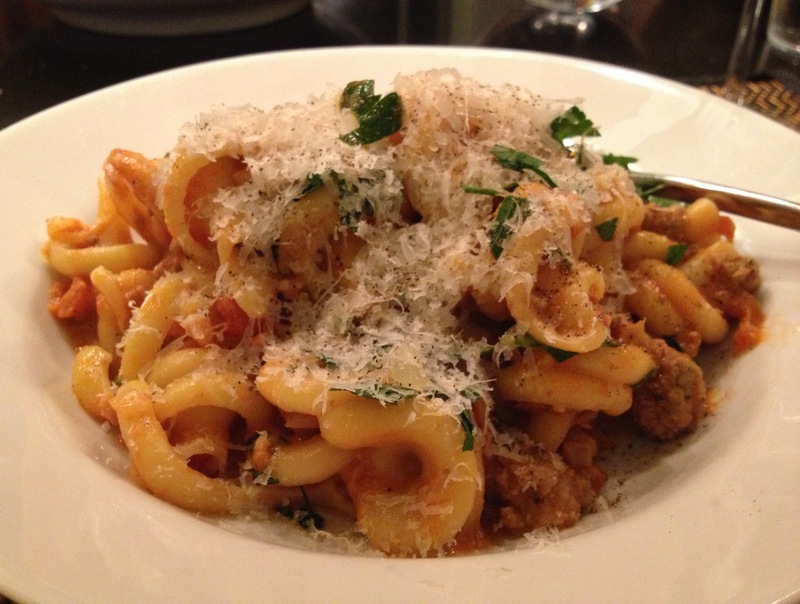 This is the kind of dish that makes you want to crawl right inside of it, cuddle up and sigh. Really. And it’s quick, easy and special enough for guests! Warm olive oil in a medium skillet and turn heat to low. A minute later, add onion and cook, stirring occasionally, until it becomes translucent, about 10 – 12 minutes. Meanwhile, set a pot of water to boil for pasta and salt it. When onion is ready, add lamb and garlic to skillet and cook, stirring to break up any clumps, until all traces of red are gone, about 5 minutes. 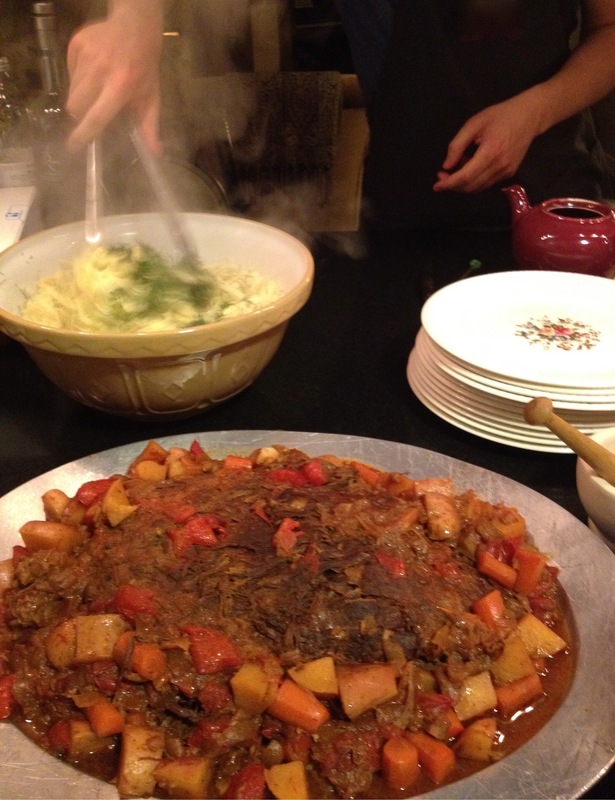 Add tomatoes and their juice to lamb mixture, then adjust heat so it simmers briskly, constantly. The sauce should thicken. Put pasta in boiling water and cook to al dente – usually 1-2 minutes less than package directions. Taste and salt and pepper your sauce. Take the sauce off the heat, add cream, stirring completely. 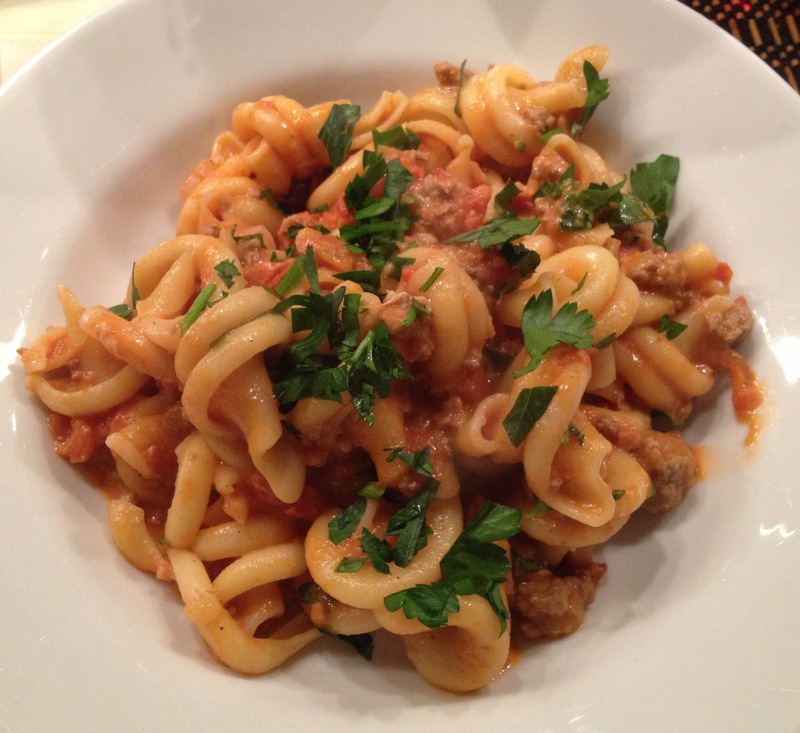 When pasta is done, drain well, toss it with sauce, some grated Pecorino Romano cheese and half the mint or parsley. Sprinkle the remaining chopped mint or parsley on top to finish the dish. Pass more cheese at the table.